Go to many of the photography forums (‘fora’?) and look up photojournalism you will find many discussions on who first uttered the immortal words “f8 and be there!” These discussions then go into semantics as to whether f8 is the best all round focal length, and then why the photographer from years ago would have settled on this focal length with his (probably) Speed Graphic camera. What all the discussions are missing is that the focal length in this situation is totally unimportant. It is the “be there” that counts. The job of a photojournalist is to get back to the editor with a usable photograph of some event, be that a fire, a debutante ball or the Australian Chamber of Commerce networking night. If you are at home fiddling with the camera’s f stops you certainly won’t get the photograph, will you! 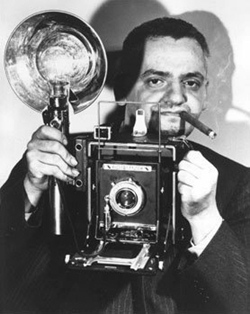 The photojournalist’s creed of f8 and be there may have come from Arthur H. Fellig, known as ‘Weegee’. Born in Poland in 1899, he came to America in 1909. “I saw an ad in a mail order catalogue which I sent away for: a tintype camera, and I decided to go into photography.” Even that statement was typical of this man. He didn’t wait to see if he was going to be any good – he was a “doer” and just waded right in and “did it”. You can warm to people with that much self-confidence. He worked for a few studios and then got a job in the darkroom at Acme Newspapers. Life in the newspaper business is always exciting and frantic. Arthur H. Fellig reveled in that excitement. He had found his niche. He was only 21 years old but he decided he was going to be a freelance news photographer. He soon became known as the first on the scene of any newsworthy happening, be that fire, murder, suicide or landslide. He was so uncannily aware of what was happening that people began to feel he had some kind of psychic powers of prediction. At that time, America was also in the middle of a Ouija Board fad and from this Fellig was to adopt his nickname “Weegee”. Weegee will be remembered for his record of the seamier side of New York life. This was put into book form, called the Naked City and was published in 1945. Unfortunately, the wide public recognition that came from this book ended the directly grotesque nature of his images and Weegee went to Hollywood where tinsel-town swallowed him up. He died in 1969.